BOU BBS Examination Routine 2019 for 1st, 2nd, 3rd year has been publish. Bangladesh Open University has been publish a exam schedule for the students of BBS 1st year, 2nd year and 3rd year. 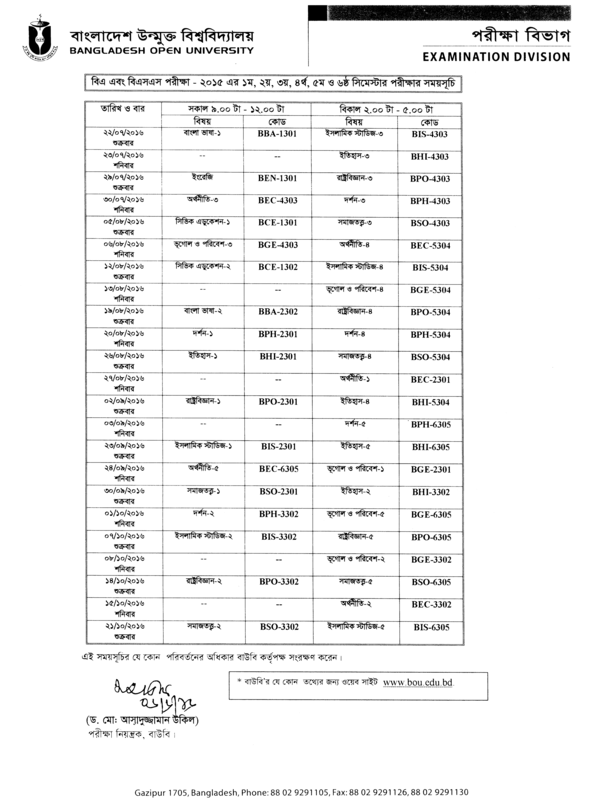 You can see the circular from our site eduexamresult.com. You can download the schedule from our site or the official website of Bangladesh Open University. The authority has been publish BBS program 1st, 2nd and 3rd year exam routine for 2018 session. According to their notice the exam will be start 19th April 2019. Now you can see your routine here. We are give you the download link. You can easily download or see your result. Exam Start: 19th April 2019. Exam End: 28th June 2019. BBS 3rd Year Viva Voce Exam: 5th July 2019 (Friday). Some exam will start on 9am and end on 12am. And some exam will be start on 2pm and it will end on 5pm. So you see the circular properly and carefully. See Your Result From Here. The authority of Bangladesh Open University has been publish BA and BSS examination Routine for the 1st, 2nd, 3rd, 4th, 5th and 6th semester. If you are students of Bangladesh Open University then see the routine from our website. The routine are given below. Viva vice Exam: Only for 2nd year 2014 Batch and re-examination will be held at respective Exam Centre. From 2015 Batch: Viva vice will be held at the end of their 3rd year exam. You can see the circular from the official website of Bangladesh Open University. If you want to know more information then go to www.bou.edu.bd or www.bousst.edu.bd and see all about information for this routine. If the authority of Bangladesh Open University change any type of information like change exam date, change re-exam date, change viva vice exam date then we are update this information here. So if you want to know latest news of this subject then stay with us. You can found here all information like BOU exam date, exam routine, Exam result etc.